In the coming weeks, Costa Rica is likely to surpass its all-time record for dengue cases since the country started keeping record. On Thursday, the Costa Rican Health Ministry reported 36,374 cases of dengue, just 1,424 behind 2005’s all-time high of 37,798 cases. So far, the Health Ministry has reported 13 suspected deaths due to this year’s epidemic. Officials said that six of the cases were still pending investigation. The ever-growing number of cases is also taking its toll on Costa Rica’s national health care system, known as the Caja. By July, the country lost 33,849 days of work so far this year to employees out sick with the virus, according to data from the Costa Rican Social Security System, dated Sept. 2. The Caja paid over $12.5 million in lost work hours, doctor visits and hospital admittances for 30,574 patients during the same period. There is, however, some respite from the rocketing numbers of new cases. The last several weeks have seen steep drops in almost every canton in the country. According to the Pan-American Health Organization (PAHO), Costa Rica is experiencing the steepest drop in new cases out of any country in Central America. During a press conference on Thursday, María Ethel Trejos of the Health Ministry said that the decrease was thanks in part to the “multiplier effect” of increased efforts by the government to unify its attack on dengue across different public institutions and through public awareness campaigns. Nicoya reported the highest number of cases, 3,341; followed by Puntarenas, 2,173; and Siquirres, 1,755. 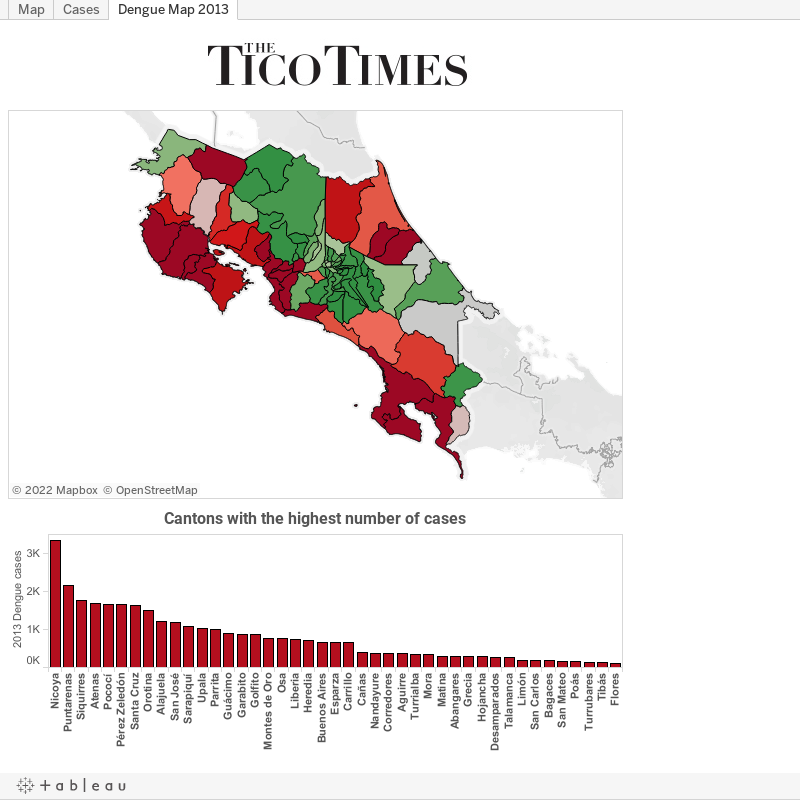 The gravest cases, however, were concentrated in Nicoya, on the Pacific coastal peninsula of the same name, which reported 29 serious cases of dengue, far and away the highest in Costa Rica. Puntarenas, the next highest and on the central Pacific coast, reported seven. The map below shows the dengue incidence rate by canton, based on Health Ministry data. Drag your mouse over a dot to display information and hold shift to scroll across the map. You can click a dot or a bar from the graph below to highlight the canton in both fields. Double-clicking an area of the map will zoom in, to help distinguish some of the cantons in the densely populated San José area. Map buttons on the top left can help to navigate as well. You can use the home button to return to the original view. Scroll down to continue reading. Dr. Oscar Méndez Campos of La Anexión Hospital in Nicoya told The Tico Times that several factors conspired to create the canton’s high numbers, from climate to public awareness. The peninsula’s warm, tropical temperatures, relatively little rainfall and calm winds are an ideal environment for mosquitoes. While Nicoya’s climate attracts many mosquitoes, many health experts are also pointing to climate change as a possible factor. The Health Ministry’s Trejos noted that Costa Rica’s dry and rainy seasons are no longer as clearly delineated as before, resulting in more rain evenly spaced throughout the year. The result is a shortened gestation period for Aedes aegypti mosquitoes, the primary carrier of the virus. Inappropriate disposal of trash leads to standing water, especially old tires, creating ideal habitats for mosquitoes to reproduce. Méndez added that the problem of waste management was principally one of education. “As long as people keep dumping their garbage in rivers and along the roads, this is going to continue,” he said. Dr. Jorge Luis Prosperi, PAHO representative in Costa Rica, agrees. Prosperi opined during a press conference Thursday that city governments need to take a more active role in addressing the solid waste problem, from garbage collection to ensuring empty lots are properly maintained. “This isn’t just a problem for the Health Ministry, it’s for everyone,” he observed. The challenge, however, remains communicating the urgency of the situation. “People still aren’t getting the message, and that’s what worries us. Every day we see it in the press, television, in our homes, but people aren’t making the change,” Méndez said. According to data from PAHO, Costa Rica has 16 percent of all dengue cases in the Central America and Mexico region, despite having only 3 percent of the region’s population. This is due to the high incidence rate. At the time of the study, PAHO reported 732 cases in Costa Rica per 100,000 residents, the highest in the region. In second place was Nicaragua, with 486 cases per 100,000 residents. Costa Rica accounted for 1 percent of all dengue cases in the Americas, according to PAHO. “We’ve lowered our defenses, here in Costa Rica and across Central America,” Prosperi said, adding that anti-dengue efforts need to take place all year long. With the rainy season set to continue through November, the number of cases will only continue to rise. “This is far from over, it’s just beginning,” Prosperi said.